Previous visit: 8-13-07. Last weekend, it was clammy and cold out with dark ominous clouds overhead, the perfect weather for hot bubbling tofu soup and kimchi… and I had a cantankerous hankering for kimchee pretty much from the moment I woke up. 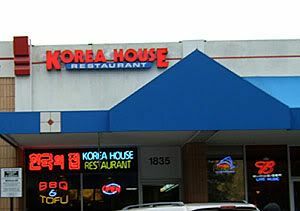 Rather than try to coerce Mr. K who tends to prefer Jamba Juice for lunch on the weekends, I called my folks up who were enthusiastic about going to lunch at Korea House in Concord. 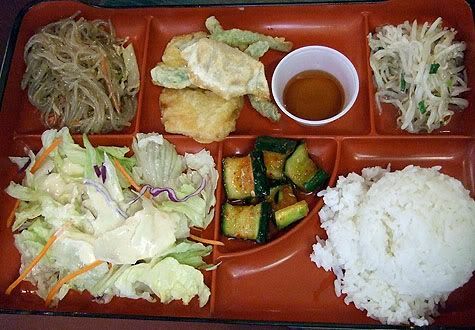 They serve a generous selection of Korean banchan – little plates of delicious fiery hot kimchis, sliced fish cakes, savory crisp fried green onion pancake, and spicy garlicky pickles. They gave us second helpings of the bean sprouts, chopchae noodles and an extra big mound of the teeny tiny silver colored dried fishes that are chewy and covered with a sweet and savory sauce because we gobbled up the first plates… One of my favorites was a beautiful transluscent savory jelly with a rich buttery texture served with a chili laced soy dressing. 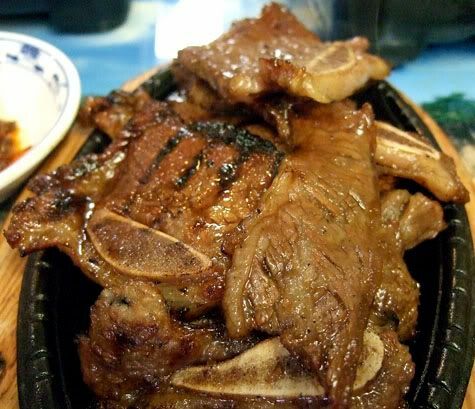 They also include a stack of Korean style dried seaweed laver which is coated with seasame oil and delicious to wrap around a bit of rice and any combination of things from the variety of little plates. The last time we ate here, my father discovered that they have obento combination lunch on the menu, which includes rice, vegetable tempura, japchae noodles, a big salad and two extra servings of pickles as a base, in addition to a large sizzling platter of grilled meat, bulgogi, which are pictured below… Obento is a japanese style boxed lunch that is generally served in partitioned trays to keep the many different elements separated visually as well as physically. We like it when we get so much food for $10 or less. 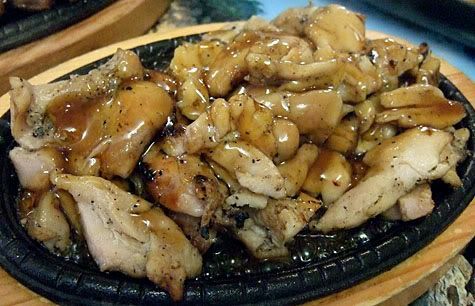 The Grilled Chicken was a combination of light and dark meat that was fresh off the grill and drizzled with a delicate soy ginger sauce that was a little on the sweet side. But again, pile in some of the garlicky kimchi, crunchy beansprouts, douse it with chili sauce and it changes your whole perspective. 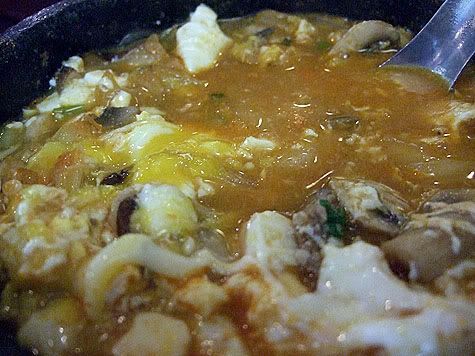 Once the soup cooled off a bit, I broke open the egg yolk, which oozed out forming rich blossoms that adds a luxurious velvety texture to each bite. The soup is garlicky and spicy and full of sliced mushrooms and silky threads of crunchy enoki mushrooms. The best part is the soft tofu that is soft as custard and evaporates in your mouth. Mmmm, it was delicious and satisfying and we were honored to have the owner stop by our table wielding chopsticks that she poked around on my father’s plate with, setting up his next bite for him! The last time we came, her only interaction was to ask our ethnicity so that she could call out sayonara as we left the restaurant. This time, she enthusiastically greeted us with Xie Xie when we entered the restaurant and she bestowed her motherly attentions by visiting our table a few times during the course of our meal. She is quite a character with an elaborately teased asymetrical doo and dramatic eyebrows. 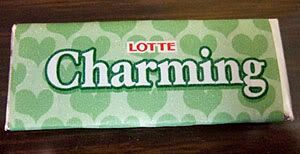 We didn’t get mochi ice cream or slices of orange to finish our meal, but a nice slice of mint gum with the bill, which we needed after all that garlic and chili sauce. 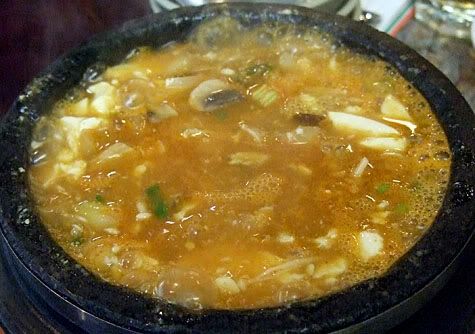 We waddled out feeling very satisfied with our feast, glad that we have an entire winter season during which we will return to warm up with the kimchi and hot tofu soup.